With frustration and divisiveness among the American populous a growing trend, some have decided the time for discontented grumbling has come to an end and action must be taken. Robin Hebrock/Pahrump Valley Times New Nevada State Movement chairman Robert Thomas III reads the Declaration of Independence from the State of Nevada on Jan. 21 while surrounded by supporters. All were sporting "yellow vests" in the name of liberty, taking a leaf out of the book of protesters in France who have recently been demanding economic justice. 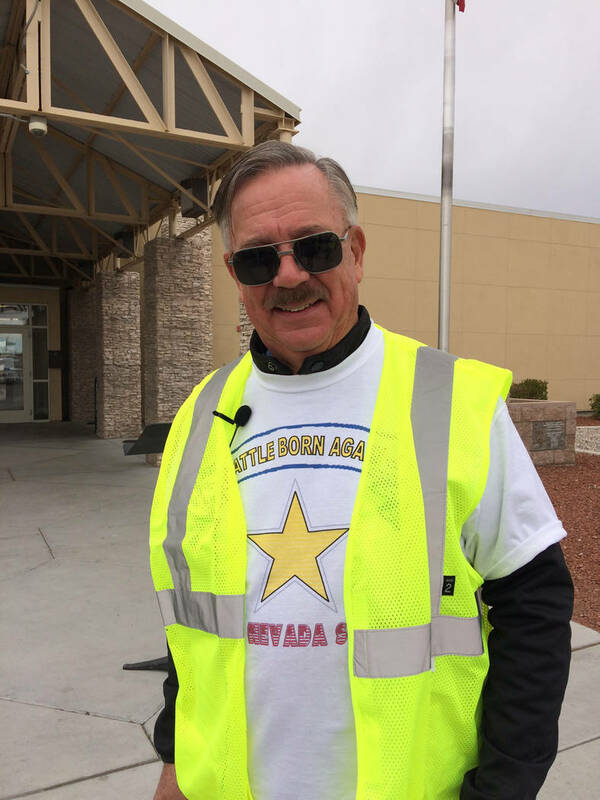 Robin Hebrock/Pahrump Valley Times New Nevada State Movement chairman Robert Thomas III poses before the Nye County Courthouse. 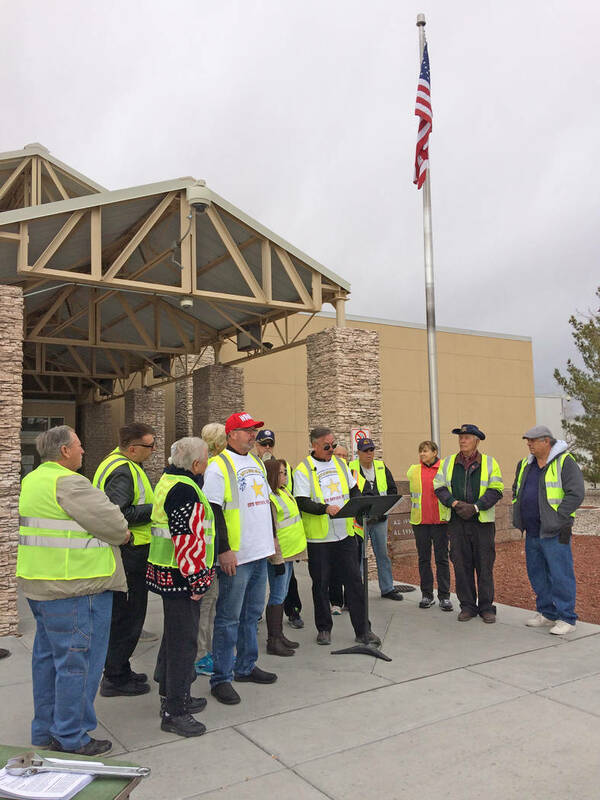 In Nye County, a New Nevada State Movement committee was formed on Jan. 16 and it is already hard at work, trying to get the word out and gather support for its mission. The declaration, a three-page document, outlined the group’s belief that the existing government in the Silver State no longer represents the will of many voters, citing such actions as the Commerce Tax as evidence. With a Democratic governor now in office and a Legislature controlled by that side of the aisle, the group also detailed its frustration with potential actions by that body. “The stated purpose of the newly-elected governor of Nevada and others of his party – now Nevada’s majority and tyrannical party – is to enact laws that violate their oaths to ‘support and defend the Constitution of the United States’, These threatened enactments include, but are not limited to, (1) the creation of a ‘sanctuary state’, (2) the restriction of our inalienable rights under the Second Amendment… and (3) the imposition of more and higher taxes. They fail to acknowledge that, ‘the power to tax is the power to destroy,’” the document states. While some may take the news with a grain of salt, committee members assured that the process they are following is tried and true, having been used before. For example, Virginia was once a single state but it is now divided into Virginia and West Virginia, the release remarked. Maine is also an example, with that state having been formed out of land that once belonged to Massachusetts. Today, there are similar movements in both California and Illinois and other states appear to be making moves toward such action as well. To reach its goal, the New Nevada State Movement will be seeking 501( c )4 status to allow it to receive non-tax-deductible donations to fund the movement. Forming committees in counties throughout the state is another key step and these will eventually elect provisional senators and assemblymen for each. The county committees will then come together to host one or more constitutional conventions to draft a constitution and New Nevada State Revised Statutes. “In doing so, we will demonstrate to all we are ready, willing and able to govern ourselves far better than the politicians of the current state of Nevada do,” the release states.